At the occasion of the 14th edition of the National Congress on the Environment (CONAMA), María J. Rubial, the coordinator of the EFG Panel of Experts on Soil Protection, has presented, on 26 November 2018, the work conducted by the Technical Committee on “Business and Biodiversity”. 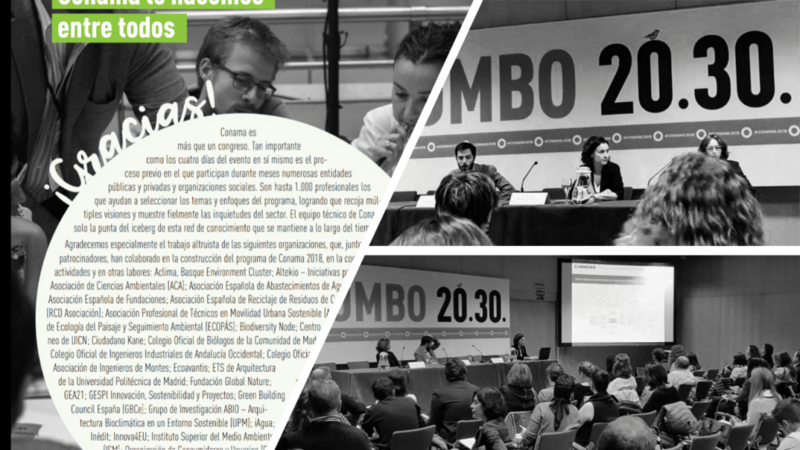 CONAMA is the benchmark for dialogue on environmental policy and innovation in Spain. The four-day event hosts a series of activities, conferences, financing workshops, stands and networking spaces for thousands of attendees ranging from company representatives, civil society organisations, scientists, ecologists, politicians, institutions to entrepreneurs. In the period 2016 – 2018, the “Business and Biodiversity” group has focused on recognising in a clearer and more effective way the business alignment with the European Directive on Biodiversity, the Aichi Targets (Convention on Biological Diversity) and the Sustainable Development Goals and their contribution to the enhancement and the protection of biodiversity. For this, a map of relations between these 3 international instruments has been drawn up, so that specific actions focused on an individual instrument acquire a new, more transversal dimension in which it becomes clear that a single action may be answering to more than one instrument. During the presentation of the committee’s work, it has also been highlighted that there are other disciplines that tend not to be considered in terms of biodiversity although they play a fundamental role. This is the case for soil protection and the different degradation mechanisms recognised at European level. Specific mention was made to other political instruments such as the EU Directive on Environmental Liability and its transposition into Spanish Law, which emphasizes the protection of natural resources and their services, and the legal basis that is now being developed for the energy transition.